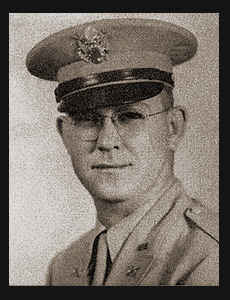 1st Lt. Houston W. Reeves, son of Mrs. George W. Reeves, graduated from Manitou High School and Okla. Univ. ; husband of the former Jessie Lee Hicks. Entered Army in July, 1943, trained in Ann Arbor, Ft. Custer, Mich., Dallas, Texas, Ft. Sill, Camp Gruber, Okla., and Camp Beale, Cal. ; went overseas in July. 1945, served in Manilla where he is now on duty. Awarded Vicotry Ribbon, Am. Defense Ribbon, Asiatic Pacific Ribbon. (as per original 1940's publication).